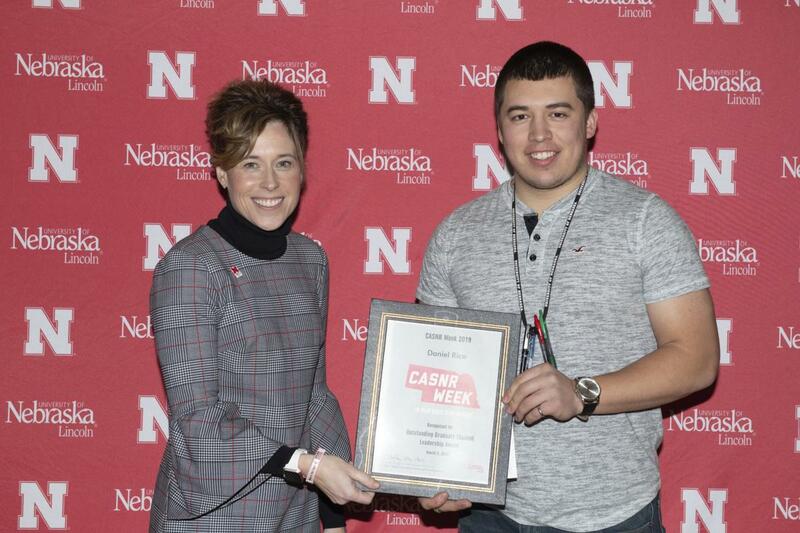 Daniel Rico receives the Outstanding Graduate Student Award from Tiffany Heng-Moss, dean of the College of Agricultural Sciences and Natural Resources, at the CASNR awards luncheon on March 8, 2019. Brittany Kirsch (M.S., Department of Agronomy and Horticulture) was elected as recruitment and retention chair of the Department of Agronomy and Horticulture's Graduate Student Association, starting in April 2019. Daniel Rico (M.S., Department of Computer Science and Engineering) was elected a senator in the Graduate College, one of six senators representing graduate students for a one-year term, starting March 2019. Daniel Rico was selected as the 2019 Outstanding Graduate Student by the College of Agricultural Sciences and Natural Resources. The complete list of award winners is here. Jazmin Castillo (M.S., School of Natural Resources) cofounded the organization Latins for Natural Resources in 2019 to educate underrepresented communities like Latin Americans about natural resources and build a community on campus between different areas of study. Lyndsie Wszola (Ph.D., School of Biological Sciences) won the R Studio Diversity Scholarship, which paid for her registration and workshop fees for rstudio::conf (the R studio developers conference) in Austin, Texas, January 15-18, 2019. Daniel Rico and the NRT program were spotlighted in the university's annual research report, released in November 2018. Christopher Fill (M.S., School of Natural Resources) and his bat research made the 2018 Halloween issue of Nebraska Today. Julie Fowler was selected by the Planting Science organization to serve as a botany mentor throughout the fall semester. She helped teach pollination concepts to high schoolers in New Jersey. Jazmin Castillo spoke with Nebraska's public TV and radio about the increasing role of women in natural resources and was featured in the August 24, 2018, NET article, "More women in Nebraska finding careers in natural resources-related fields." Jazmin Castillo was chosen to serve as a graduate representative on the Chancellor's Commission on the Status of Women for the 2018-2019 school year. Christopher Fill was spotlighted as a graduate student in IANR News and on the School of Natural Resources website in July 2018.